Gamagara Development Forum (GDF) in partnership with Deben Primary School and the Department of Education in Northern Cape, launched Grade R classes for Deben Pre-Primary School, in Deben Village, on 30 August 2013. Deben Pre Primary had one classroom for Grade R which accommodated 80 kids, and the grade R practitioner informed that almost more than 60 children were are on the waiting list due to limited class capacity. The kids on the waiting list are deprived education because the alternative Grade R in Deben were the kids can be accommodated. GDF saw the need to construct an ECD Centre that will provide learning for 80 kids from Deben in addition to the existing one classroom and also saw to take upon the need of provide nutritional meals for learners between the ages of 5 and7, from previously disadvantage communities through the nutritional scheme. The Grade R classes’ project was created to also assist kids within the area to comply with the requirements for Grade R and 1, as outlined in the policies of the Department of Education. GDF provided additional classrooms at a capacity of 80 children, learning materials, indoor and outdoor games. 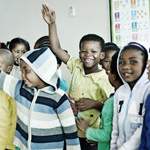 The outcomes that GDF is hoping to see at Deben Pre-primary school is the improvement of the inclusive learning environment for all kids in Deben, provision of Education for all kids in Deben, hence no kind will be on the waiting list. of the young children and their parents possible by funding the Grade R classes, which will ensure that more children are enrolled at the school. Mr Buys from the Department of Education in the Northern Cape said that grade R is a program to prepare five year olds for formal schooling. He said that the Deben ECD centre is an investment in the improvement of Deben’s future, he also said he believes that through education, crime will be decreased and Salaries will increase for children who are soon to be adults. Ms Letshego Mafojane the project manager for Welfare, Humanitarian and Welfare said that the objective of GDF was to provide children in grade R with ample space and equipments that are conducive for learning, stimulation and development to children in that age cohort, at the same time ensuring that they receive quality early childhood education, preparing the children for Grade 1 in a more structured environment. She further said that the construction of the grade R classes and provision of learning material definitely provide a safe, clean, child caring, nurturing and conducive learning environment to children in Deben Pre-Primary. It is therefore vital that all stakeholders work collaboratively in bringing together knowledge, skills and resources in ensuring that children are provided with the best start in life, be it emotionally, physically, nutritionally, cognitively, socially and economically. Ms Angeine Modise who spoke on behalf of the GDF board said that Implementation of ECD programmes is an inter-sectoral responsibility that should be shared and should not be the responsibility of the Department of education alone. She said that GDF have made it their priority to ensure that children receive the development they need, and that is why GDF ensured that they build the children of Deben Pre-Primary classrooms that are secure and safe. Ms Modise emphasised that GDF has prioritized Education and Development as its top priority focus area, she said this is done because education has the potential to pull people out of conditions of poverty. “Through education, we can ensure that every child grows up to his or her full potential. Early Childhood Development Programme is the beginning and the foundation of quality and formal education.” She added that in order for the children to perform well throughout the education system, it was important that all children receive appropriate stimulation, intellectual development and are ready for school by the age of 6 years. Guests were entertained by a local gospel group, Sishen Intermediate School Cultural Group, the field band, Blue Chilli Music Band and a sterling performance by the GDF Project Manager for Infrastructure, Land and Housing Mr Tshenolo Mampe. Gamagara Development Forum (GDF) hosted the Annual General Meeting (AGM) for the year ended 31 December 2012 on 16 October 2013 at Sesheng Hall.